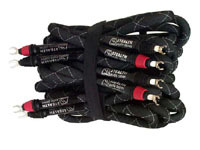 Ultimate Ribbon - an optimized and geometrically arranged combination of various individually insulated flat solid-core pure silver conductors (9.5 AWG per cable, 6.5 AWG per speaker). Standard Termination is pure silver spade lugs (6 mm binding post opening) This is an attempt to design the best possible pure silver speaker cable, leaving economic considerations largely aside. It is thick enough to be capable of driving any speaker full-range at well over 1000W constant power with excellent transient response and great bottom end and treble extension. It achieves close to perfect coherence and tonal balance, while keeping the "sweetness" and naturalness of a silky-smooth "silver sound". Please check the latest reviews and customers' feedback on the UR speaker cables. ... I couldn't help myself and swapped in the STEALTH Ultimate Ribbons in my tube system, and the Varidig and - Oh, my God! I thought I had died and gone to heaven. This was amazing! I didn't budge for about an hour, really really nice. I might leave this as it is. The Ultimate Ribbon sure is something special and made an enormous improvement on that system, Like I said, I was transfixed. The detail they convey is remarkable and their quickness and extension awesome. The center image is more than amazing it is magic, you feel like you can reach out and touch the musicians! It has such power to the bass, and the highs really sound pristine. The mids do not suffer, I can hear the fineness of clarity and freedom of the high end, female vocals just float like silvery clouds. The bass is stupendous, has a whole different character and too I can detect a quietness or blackness between the notes when separated from the highs. The URs are so fantastic, I mean they're worth the entire system! Thank you so much for this opportunity to remove all doubt about which of STEALTH speaker cables I like!